The European Balloon Festival is the largest balloon festival in Spain and one of the largest in Europe. Visitors can enjoy the spectacle of seeing more than 50 hot air balloons flying and competing in races around the town of Igualada, just 40 miles west of Barcelona. Visitors can also participate in scheduled activities, including bike courses, sumo and juggling workshops; view 'wind igloos' – old balloons used for concerts, event venues and swimming pools – or take off in a balloon themselves. The evenings bring another flavour to the festival with 'Night Glow' during which the balloons are filled with light and accompanied by a firework display. The beautiful Castell de Peralada and its expansive gardens, located just 40 minutes from Girona by car, are a picturesque setting for this renowned music festival. From 6 July to 17 August, visitors can enjoy concerts across a variety of music styles, including pop, symphony, jazz and opera, as well as theatre shows, on the festival's three stages. Catch performances ranging from Georgian-British songwriter, Katie Melua, to Academy Award winner, Juliette Binoche. ViJazz Penedes combines the renowned wines of the Penedes region – known as the capital of wine in Catalonia – with acclaimed jazz. Attendees can enjoy live jazz while trying over 300 types of wine and cava from 40 different Penedes cellars. A wine fair will offer visitors the chance to participate in wine tasting and pairing sessions by top wine experts and sommeliers. Many of the international scene's most reputable jazz figures, such as Joan Chamorro and the James Brown Original Band, play free concerts in the historic centre of Vilafranca del Penedes. One of the most popular events on the Costa Brava, Cap Roig Festival is a series of outdoor summer concerts set in the auditorium of 'Jardins de Cap Roig' – the botanical gardens of the 20th century Cap Roig castle. This year's line-up includes Passenger, Wilco, Norah Jones + The Candles and Jason Derulo. In addition to incredible music acts and a beautiful setting, the festival also boasts an exceptional dining experience from the Michelin starred Via Veneto restaurant. Located on the banks of the River Ebro, the city of Tortosa was an important centre of Catalan Renaissance art which retains a strong Medieval and Renaissance heritage. Among the most striking of historic sites is the towering Arab castle of La Suda, now a Parador de Turismo hotel – an ideal base from which to experience the city's living history. This July, visitors will be immersed in the splendour of the 16th century during the annual Renaissance Festival when over 500 actors and musicians join 3,000 townspeople in bringing the era vividly to life. Sample Renaissance delicacies, witness a sword fight and dance to Renaissance music. 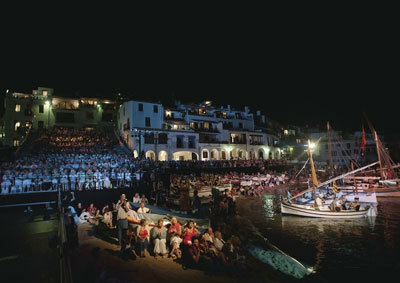 Each summer, the Costa Brava town of Blanes plays host to the International Costa Brava Fireworks Contest. Set during the Festa Major de Santa Ana de Blases, the festival is in honour of the town's patron saint and sees pyrotechnics companies from around the world compete to put on the most innovative and dazzling fireworks display. The 2017 line-up will host 16 companies who will entertain crowds each evening with amazing shows of light and sound along the Blanes seafront, with shows attempting to impress judges across two categories – 'popular' and 'technical'. Throughout August, the towns of Catalonia celebrate the 'festa major' in honour of their patron saints. Each town hosts its own lively party in which the town square takes centre stage, incorporating dancing, parades, music and spectacular fire shows. Barcelona's Gracia Festival celebrates its 200th anniversary this year and will run from 15 – 21 August. The neighbourhood is illuminated and decorated with handmade crafts, with different streets vying to be named 'best decorated'. Locals parade through the streets and participate in activities including human towers. Visitors can experience unique aspects of Catalan culture, including the traditional 'correfoc' where visitors are chased by groups brandishing sparkling fireworks.